Our 2001 reunion was a complete success. We brought 450 Shipmates together in Massachusetts. From Thursday to Sunday we reminisced and enjoyed each other's company, and we swapped sea stories while visiting some unique New England sites (in perfect weather). 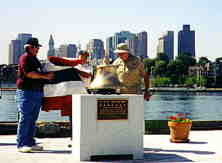 Most importantly, we dedicated a memorial to 225 years of BOSTON crew service to America. This memorial is located within feet of Old Ironsides, the oldest commissioned ship in the U. S. Navy---a ship that is younger than three of our BOSTONs. Did I mention that our reunions are fun? On Thursday the early arrivers were treated to a Hawaiian luau. Reunion Chairman, Nancy Anne Hebert is seen here decked out in aloha shirt, grass skirt, and leis. We couldn't get her to wear the coconut shells! On Friday, we dedicated our monument, which resides within feet of Old Ironsides. Here's the view looking north from our monument. 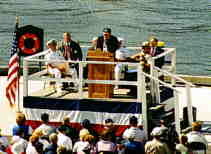 Captain Charles Hulett, our Director of Exhibits, worked with the National Park Service to make it possible for our monument to be on Constitution Pier. Flanking the podium here you see members of Boy Scout Troop 89 from Medfield, Massachusetts. These young men volunteered to assist with our dedication ceremony, and did a fine job. We were glad to have them with us. 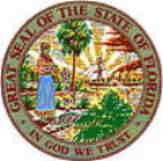 Chaplain Hodgkins presented the invocation and benediction. 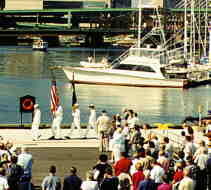 The colors of our country were paraded and posted by the Color Guard from the crew of the USS CONSTITUTION. Bill Foley, the Chief of Interpretation for the Boston National Historical Park, Department of the Interior, has been our liaison for the planning for our memorial. The National Park Service cohosted our dedication ceremony. 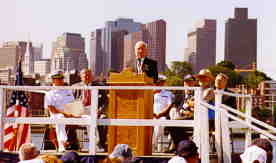 Captain Raymond Komorowski, the last Captain of the cruiser BOSTON, presented stirring comments---as always. 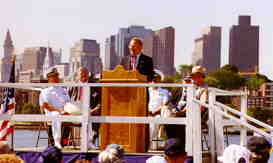 When the BOSTON was decommissioned in Boston in 1970, the Mayor of Boston gave Captain Komorowski a letter granting him permission to "graze his cattle upon Boston Common, and to cast tea into Boston Harbor." In commemoration of this august event, the good Captain's daughter Claire indeed tossed a tea bag (biodegradable, of course!) into Boston harbor. And then the moment of truth had arrived. Our monument was unveiled by a team consisting of Shipmates from the SSN703, the CAG1, and the CA69. Rick Geddes (TMC(SS) 1980-1984), a Plankowner, Mike Brady (FT3 1957-1959, and O. Fred Tapley (CPL 1943-1945), also a Plankowner, uncover our masterpiece. That's over two tons of Massachusetts granite topped by 450 pounds of USS BOSTON ship's bell. 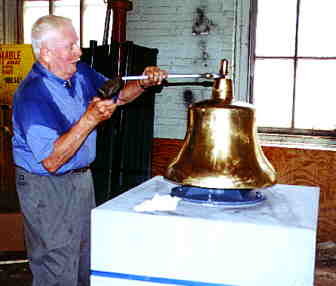 Fred Tapley, our Master Craftsman, worked diligently on the bell and its supporting structure for several months. We also have some pix of the work in progress, and the bell monument subcommittee. Following the Memorial Ceremony, the chow line formed to board the M/V Odyssey, which docked next to our momument to pick us up. 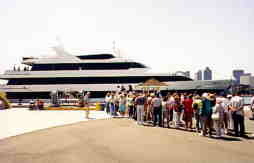 We then enjoyed a great harbor cruise and gourmet lunch. We deserved it. 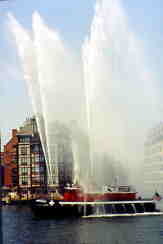 Thanks to the efforts of Shipmate John Donlon, a member of the New York Fireboat Department, the Boston Fireboat escorted us down the harbor and put on a great display for us. 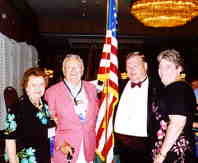 Shown here are Mary Ellen Komorowski, Captain Komorowski, our President Barry Probst, and Pat Probst. 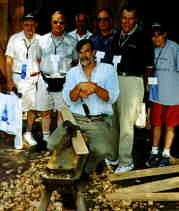 On Sunday several of our Shipmates watched as a Strawberry Banke craftsman made oak barrel staves the old-fashioned way. 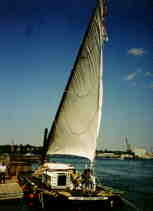 ...while two more Shipmates enjoyed a rest on the poop deck of an authentic gundalow moored in the Piscataqua River.